Did you know that black cats are lucky? They get a bad rap in this country, but the truth is that black cats have been viewed as luck bringers and guardians over many centuries and in many cultures. The black cat has an amazing history and their story is closely intertwined with ours. Their treatment has varied, depending on how we humans view them. (1) Let's begin with an old charm, and a modern problem, and move on from there to the myths, stories and science surrounding these dark beauties. Sleeping in a crate at the Montgomery County Humane Society with three other orphaned cats, 3-month-old Lark would seem to be the model of an adoptable cat. She is fuzzy, friendly toward people, and the domestic shorthair kitten has her life in front of her. There’s just one small problem with Lark: she’s black. In the numbers game that is animal adoption, that detail moves Lark and other cats like her to the proverbial back of the adoption line. will euthanize black cats first because it is so hard for them to find homes. 10. You'll save $$ on their Halloween costumes. 9. You can always find them in the snow. 8. Holding a black cat is very slimming. 7. Black cats will match any decor. 6. A lint brush isn't required for a black-tie affair. 5. When you love a black cat, Luck is on your side. 4. Black cats are like onyx, a beautiful gem. 3. Hey, they don't care what color you are! 2. Love knows no color. 1. They are the least likely to be adopted. * Freya, the Norse Goddess of Love & Fertility drives a chariot pulled by two black cats. * To dream of a black cat is thought by many people to be a lucky omen. * Many theater folk love cats, perhaps because they, too, were once ostracized and shunned. 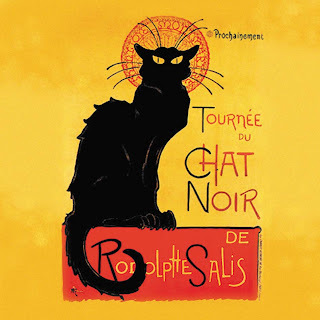 It is blieved that a black cat in the audience on opening night portends a successful play. * In the south of France, black cats are referred to as "matagots" or "magician cats." According to local superstition, they bring good luck to owners who feed them well and treat them with the respect they deserve. * Fisherman's wives kept black cats while their husbands went away to sea believing that the black cats would prevent danger from occurring to their husbands. These black cats were treated like royalty and were considered so valuable that they were often stolen. At one point, they became so expense that few fisher folk could afford them. The lasses of lovers will have no lack. * In Australia and Britain and other parts of the world where black is a protective color, black cats are though to be lucky. It was believed that their color gave them the power to ward off negative forces. * In Ancient Egypt, cats were sacred and protected by the Goddesses Sekmet and Bast. A home that kept a cat was blessed. Egyptians believed that cats captured the glow of the setting sun in their eyes and kept it safe until morning. Killing or harming a cat was a horrible crime in their culture, and was punished by death. * In the English Midlands, a black cat as a wedding present is thought to bring good luck to the bride. * Many cultures believe that cats with gold or green eyes bring prosperity. Because of their eye and coat colors, black cats are thought to have ability to attract abundance and the power to protect it. * Many cultures consider cats to be mystical creatures which were really fairies or in disguise. * Some say that the ancient Celts believed that black cats were reincarnated beings who could foretell the future. * Cats have always been associated with motherhood, protection, love and fertility, and it many cultures, black is the color of protection. * Advocates of Feng Shui remind us that cats are drawn to harmony. Therefore a happy cat is the sign of a happy, harmonious home. A figurine of a black cat is often placed in the home, facing north, to ward off evil. * In some cultures, brides were given black cats as good luck on their wedding day. * In Finland black cats were thought to gently carry the souls of the dead to the other world. * In Scotland it was believed that if a black cat crosses your path it will mean good things to come. A black cat on your porch will bring prosperity. * For those who loved The Da Vinci Code, Leonardo da Vinci loved cats, and included many in his sketches, including one in the British Museum which show a Madonna with child and cat. * King Charles I of England owned a black cat, whom he valued very much. He treasured the cat so much that he had his guards watch over it 24 hours a day. As luck would have it, the day after the cat died from an illness, the king was arrested. Mysterious * Alluring * Beautiful * Playful * Elegant * Gorgeous. All these words and more describe the unique glamour and mystique of the black cat. Mary Ann Miller, writing for The CatSite.com, tells us how such beautiful animals got such a bad rap here in the U.S. Some researchers believe that studying the ancient mutation of color in black cats may lead to a better understanding of and treatments for aids and various types of cancer. Action Cat notes that "Michelle Meister-Weisbarth, a student at the Virginia-Maryland Regional College of Veterinary Medicine, has developed a genetically engineered bacterium that can be used as an oral contraceptive to control the unwanted cat population. Meister-Weisbarth has been working with faculty mentor and molecular biologist Dr. Stephen Boyle, using genetic engineering technology to modify an approved vaccine, a strain of the bacterium Salmonella, which could then be delivered to feral cats in the wild via a vaccine-laden bait." An FAQ follows at the website. "No one again will hurt you,"
you'll have enough to eat,"
a line that never ends." are searching near and far." for a special cat like you." The Lucky Black Cats Group. Their motto is "Black is beautiful, especially in fur"
Please note: FCE has no affliliation with these groups or stores. We have not received any gifts or funds for their mention here. (1) Best Cat Art notes that Pope Gregory IX declared the cat to be a "Diabolical Creature". Persons that kept cats were suspected of being witches, and were put to death along with their feline pet. Cats were beaten, killed and driven away from towns and villages. In fact the domestic cat population of Europe came close to being wiped out. Some of the superstitions from those times surrounding cats, have survived history, such as believing it bad luck to let a black cat cross your path. Eventually the witch hunts ceased, and cats once again became highly prized and loved, household pets. By the late 1800s distinctive breeds were being established and cat shows held, with the long-haired breeds especially popular. Sia's note: Ironically, the Black Plague, which was spread throughout medieaval Europe by rats and killed many millions of people, was made a thousand times worse by the killing of so many cats, their natural predator. The Irish have a saying that to kill a cat brings 17 years of back luck - seems right to me. My thanks to this website for some of the notes on luck and black cats. What is it about black cats and kittens, that they're always the last to get adopted? It's not many a cat that can successfully pretend to be a black panther in miniature! This is the one color of cat that you can bet will be a 'character' cat. Quirky, usually with exceptional temperaments.....black cats are, without doubt, the 'dark horse' at the personality stakes. It's as if they've been purpose-designed to appeal only to the non-superficial amongst us. Give one a chance. You won't be disappointed. And if you're feeling very avant garde...try two together. You too could have your friends and neighbours treating you with added respect, when they see your two black cats walking towards them purposefully! That poster hangs in my kitchen. When Grandson sees it, he says "maow" -- which is his word for cat. The sweetest cat I ever knew was a pure black, part Siamese who was with me for 10-1/2 years. He was more than a friend, much like a little brother. When he died, I grieved for him as deeply as for any member of my family. It's been more than six years and I still have dreams about him. If I had my choice of any color cat, I would choose a black cat again in a snap. They are indeed Good Luck! I'd also recommend that anyone looking for a cat consider adopting an adult cat in need from a shelter. Some of the sweetest pets and best friends don't necessarily come to us as babies, but are very grateful for a new, loving home. Thanks for visiting Spirit Blooms! I have had the great fortune of being closely intertwined with two black cats in my short life. Both of whom found me under peculiar circumstances and times of great need. One still resides on earth today, but lives with my mother as my current living situation can not accommodate a cat :( He however has been one of the truest friends I've ever known and I miss him dearly. A tiny black feral kitten found me and I knew the moment I lifted her into my arms...and my heart...it was meant to be.